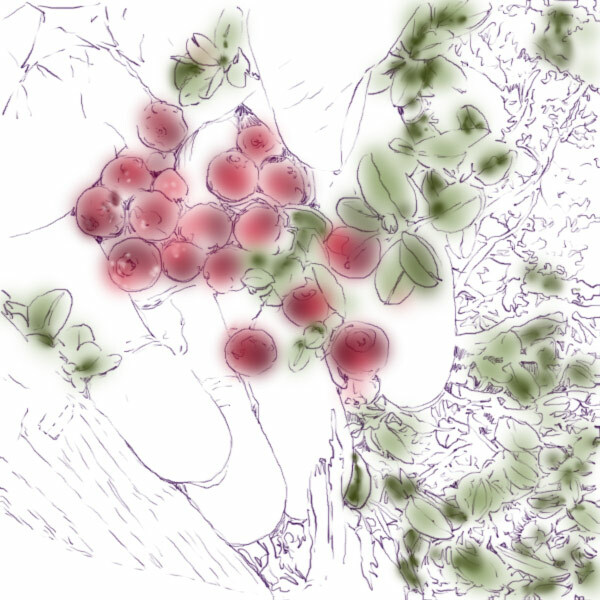 In other parts of the world, these berries are known as Lingonberries, or Partridgeberries, or Foxberries. Whatever they are called, these berries are appreciated for their tart, rich fruity taste and for their health-promoting nutrients. Around here, people simply call them Redberries, and they get out their recipes for redberry muffins, jams, puddings, cakes, breads and steaming spicy redberry teas. I had the good fortune to go wilderness berry picking several times in the past few weeks, and besides bringing home buckets of these bright red beauties, I also brought back a store of ideas of images and stories that I want to illustrate. I will be experimenting with my digital graphics tablet and from time to time, you will get to see these explorations. And if you have some Redberry muffins or Redberry tea at hand while you are following my explorations, so much the better!